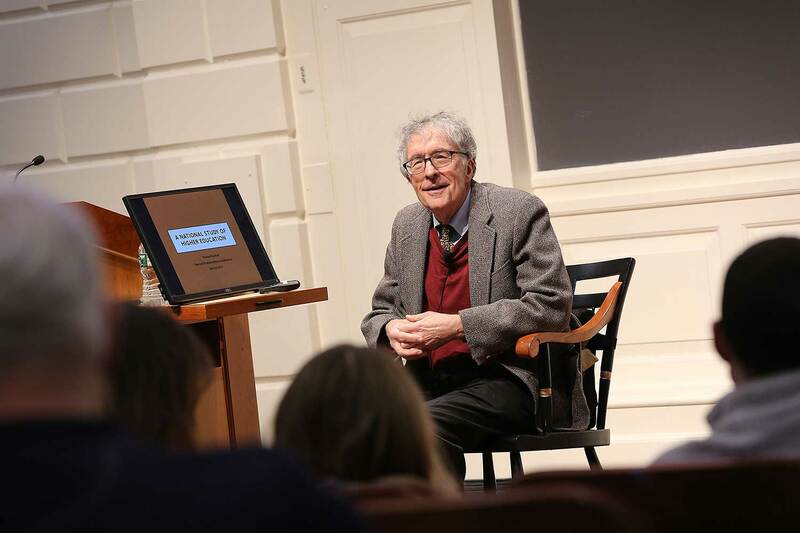 Professor Howard Gardner is exploring what it means to provide quality higher education today by closely examining the experiences of its stakeholders. While the state of higher education has been in flux for a decade or so, little is known about how the changes will actually affect those stakeholders — students, faculty, administrators, and others — today and in the future. Over the past seven years, Gardner and his team (which includes Wendy Fischman, senior project manager, and Professor Richard Light, senior adviser) have interviewed more than 2,000 students, faculty members, administrators, and constituents from 10 disparate colleges and universities to better understand many facets of the college experience, including the purpose of college, the academic experience, campus life, curriculum changes, and more generally, the liberal arts and sciences. (According to Gardner, the latter was an initial focus of the study, until one early finding revealed that too often people misunderstood the meaning of liberal arts and sciences.) The robust data they collected examines a range of topics, from the different “mental models” with which students approach college-going to what makes a given college program succeed to what books are recommended for graduating college students (Dr. Seuss, Malcolm Gladwell, and Dale Carnegie garner many mentions). “We are still figuring out how to formulate the findings and what the messages are for each of the audiences that we hope to address,” Gardner says. He contends that he began the research with no hypotheses, focusing more on “listening for the unexpected” in the interviews, many of which were conducted in person. During a recent three-part lecture series at the Ed School, Gardner shared early insights into the data, including how colleges are much more similar than they are different, in that many students use the same language to describe their experiences and have the same concerns. The 40-question interview was divided equally between academics and campus life — “personal issues,” says Gardner, often “emerge as the most important topic on their minds.” Three distinct areas emerged — academics, peer relations, and institution — where many students admit to struggling with feelings of not belonging or of frank alienation. Though Gardner does not offer solutions to these challenges, he stresses the importance of further examining why some schools have more pressing issues of alienation among students as compared to other schools, and how to consider these challenges without preventing opportunities for individual growth. “The feeling of not belonging is much wider-spread than it should be,” he says. A major part of the research examines how students think about going to college. Gardner and his team discovered four categories in the responses: those who see college the expected next step after high school (inertial); those who see college as a stepping stone principally to a job, career, or graduate school (transactional); those who see college as a time to study new things (exploratory); and those who see college as a chance to discover who you are and what you might become (transformational). Transactional perspectives ranked high across the several schools in the study, according to Gardner, but with further analysis, the researchers will look at how students think about their college experience, what they hope to gain from it, and how those hopes might change over time. “It seems important to know, what is the predominant model among incoming students and to compare it with graduating students in various campuses,” he says. In the coming months, Gardner, who regularly updates his blog on findings, will finish the data analysis and share more formal findings. He and Fischman have already presented seven broad takeaways for college presidents, at a January meeting of the Council of Independent Colleges, and plan to continue to solicit feedback. “We want to illuminate the current situation of higher education and make thoughtful recommendations about the sector going forward,” he says.